This website is dedicated to Fine Art Photography. Photography is about the art of seeing the light and recording it. My Dad taught me. He gave me my first camera when I was eight years old. He was a professional photographer who loved what he did. I inherited his love of the medium. After he past away I decided I would create a website to share some of his work. His name was John H. Popper. You can find several of his images under the “portfolios” menu so please check it out. I have also included several of my own portfolios and links to books I have created. If you are looking to acquire art, I am offering images for sale through “Fine Art America”. Click here to view what is available. 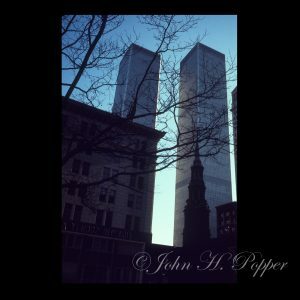 This photograph of the Twin Towers taken before 9/11 was my Dad’s. I have included some of his work which you can find under “portfolios”. Enjoy!